Hamburger Fried Rice is a quick and easy weekday dish you can whip up in no time. Mixing together some simple ground beef, onions, frozen peas, and leftover rice can create a delicious meal. Combine the warm beef stock or water, soy sauces, oyster sauce, sesame oil, and black pepper in a small bowl. Take your cooked rice and fluff it with a fork or with your hands (you can rinse your hands in cold water if the rice starts sticking to them). Try to break up any clumps as best as possible. Heat your wok until just smoking, and coat your wok with 2 tablespoons vegetable oil. A seasoned carbon steel wok or a non-stick pan is good for this hamburger fried rice, since the rice in this dish is prone to sticking. Add your ground beef and stir-fry until browned and fragrant. Break the hamburger meat up, but don’t be obsessive about it. It’s ok to have small delicious chunks of ground beef with the rice. Next, add the onions, minced garlic and Shaoxing wine. Reduce the heat to medium high and continue to cook until the onions are translucent. Stir in the sauce mixture and bring it to a simmer. The sauce will deglaze all those tasty bits of hamburger clinging to the wok or pan. Next, add in the rice and stir everything together until well mixed and the rice is uniform in color, about 1 minute. Increase the heat to high. Add in the peas and continue to stir-fry in a scooping motion for another 2 to 4 minutes or until the rice is heated through. Next, stir in the scallions until distributed through the rice and transfer the rice to serving plates. Fry your eggs in your wok or non-stick frying pan. We like eggs cooked both sunny side up or over easy, but you can make them however you like! The key to making a good fried egg is to heat the frying pan to high heat before adding a couple teaspoons of oil and the egg. While the egg is frying, make the sweet soy sauce mixture by combining 1 tablespoon soy sauce, 3 tablespoons hot water, and a teaspoon of sugar until the sugar is dissolved. 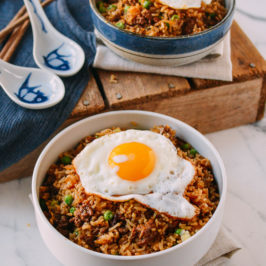 Serve your fried egg right on top of your hamburger fried rice and drizzle some sweet soy sauce on top of the egg before serving or serve it on the side.